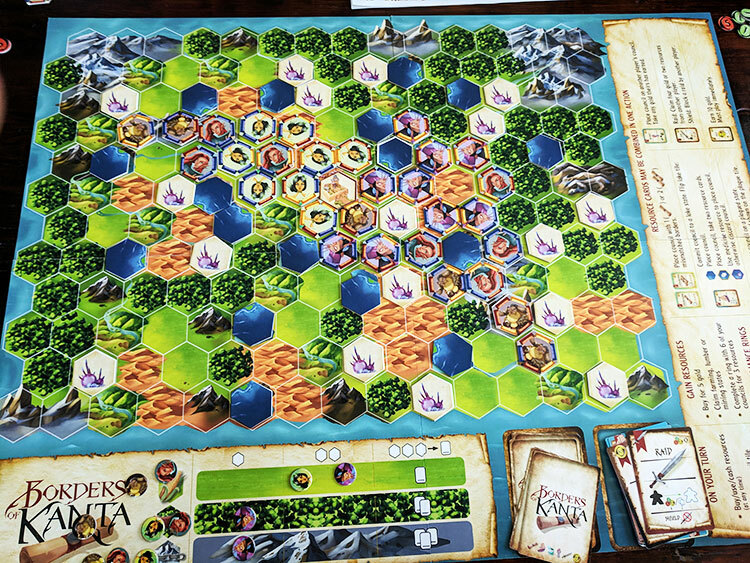 Borders of Kanta has players write the story of the recovery of the lands of Kanta following a ruthless plague. Eight clans, forced behind the walls of the capital city, must now reclaim what was once theirs and eradicate the last pockets of plague left in the realm. Each player takes leadership of one of these clans and tasks councils of six to rediscover their lost lands and collect resources. Throughout their exploration, councils will bring with them language and medicine as well as revolt, war, competition, and greed. 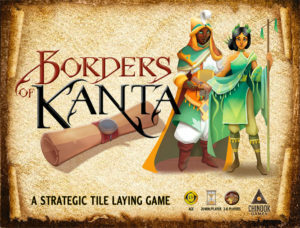 Borders of Kanta is a hex-tile laying, abstract, area control game designed by Lorne Kletke for Chinook Games and is coming to Kickstarter. It plays 2 to 6 players in 60 to 90 minutes. 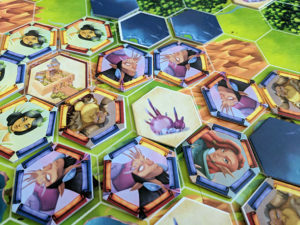 Players start Borders of Kanta with a hand of cards, a pile of hex/council tiles with different colors representing different languages (yellow, red, blue) on each edge, and one of eight unique clans that have some set of rule bending abilities. These abilities are of the usual sort, like preventing certain tile placements, generating more resource cards, gold, or benefiting from player interactions in which a player is not involved. 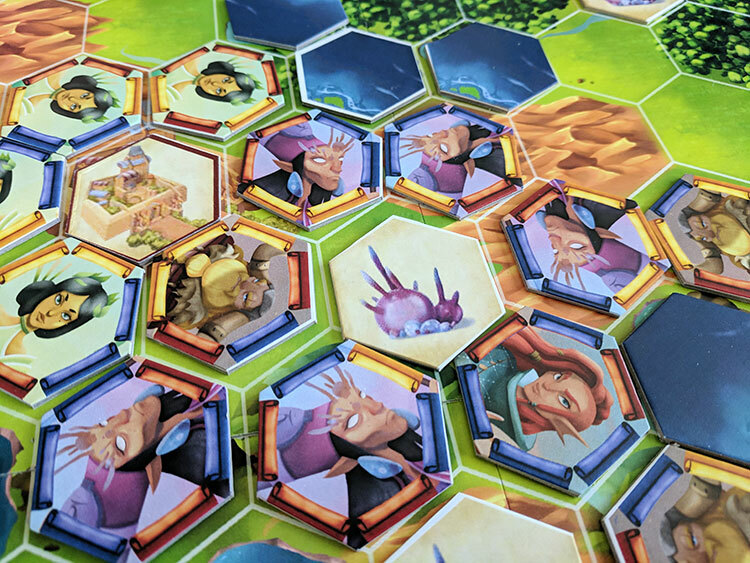 Players match the languages (colors) on the sides of their councils (hex-tiles) to score hex rings. Each turn players choose one of their three visible hexes to place on a terrain location, lining up like-colored sides with what has already been placed on the board. The basic goal each turn is for a player to complete hex rings and collect gold based on how many hexes the player has in that ring. Players must be mindful that although a single tile can complete several rings (reaping sweet golden rewards) it could also be create a windfall of points for their opponents. As gold is how you win the game, a clever (or not-so-clever) placement can reap some serious rewards and trigger some serious competition. 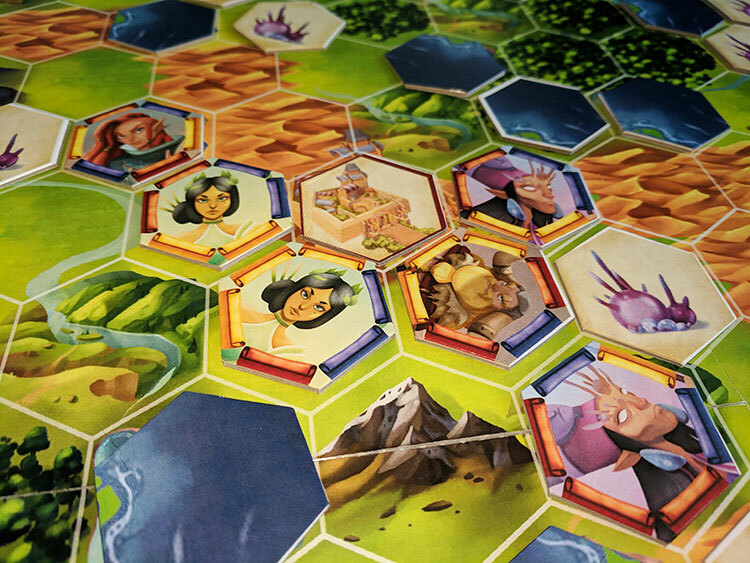 The opening board state shows the beautiful artwork of the land of Kanta with an overlayed hex grid and more than a handful of obstacles for the players. The gorgeously detailed terrain (plains, forests, and mountains) generate cards for players at different rates when a tile is placed. That is, for every 3 tiles a player has placed on plains, forests, or mountains; one, two, or three cards are received respectively. However, complicating placement are the lake and plague tiles that are peppered throughout which don’t allow placement without being managed by cards first. Boats to flip a lake tile. medicine to flip plague tiles. interpreters to disregard color placement rules on a side of a hex. Raids to steal gold from another player or defend against such. Revolts to steal a hex location from an already placed tile, collecting benefits. Gold to be used for buying cards or end game scoring. The player with the most gold at the end of the game wins. The artwork and graphic design are both beautiful and functional. We were almost disappointed when we covered it with tiles. In the prototype rules we played, the clans were well balanced and no one seemed to feel hamstrung by their choices. I have no doubt that this balancing will totally pay off for backers in the end. My gaming group loves the challenges presented in these types of open playing field area control games. Every playthrough warrants finding a new strategy with a previously used clan or trying on another clan to see if it will be a better fit. It is also interesting to see how differently the councils ring their way out of the capital city. While a good portion of this may be due to the hexes available to each player, it definitely did not seem random or out of control. The cards are a huge factor in the balance of this game. 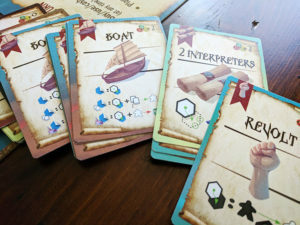 Players typically start the game trying to only match one-side of a hex, which is not a terribly limiting requirement. As the board state develops and players fall into their own strategies, two sides must be matched and so on. It was only the last few tile placements where we found ourselves wishing for that perfect piece to match the maximum number of sides and complete a multitude of rings. There is a lot going on in Borders of Kanta. The ruleset for the game is so simple and leads to such complexity, I am frankly surprised it wasn’t already made. It is very much its own game and while I am typically partial to meatier Euros, the visual puzzle of this tile-placer was a sure crowd pleaser. It really is as simple as it sounds, match colors and place a hex, but it quickly rings its way out from the center of the board and turns into a medium weight brain-burner. While there is the potential for gotcha-esqe gameplay with the revolt and raid cards and more than a couple clan abilities; none of these felt overpowered or left players with more than a fleeting sense of friendly competition. The balance of abilities and actions throughout Borders of Kanta shines brightly and was clearly a priority in the design. Attempting to place on a plague tile requires players to use medicine cards. We don’t usually discuss aesthetics in a preview, but this prototype had such great artwork that I would be doing you a disservice not to mention it. The art throughout the entire game is fantastic, colorful, detailed, and just generally fun. The graphic design is easy to read and intuitive. It bears a resemblance to some artwork for mobile apps out there without being overly whimsical. All in all, much like the ruleset, no stone was left unturned. At the time of this preview, the rules are mostly complete, but still actively being refined. Let me tell you though, this development is one of the most robust and thorough development processes that I have seen with a small publisher. In fact, the rules were being so actively playtested and refined during my time with the game, that I effectively played three different (and progressively more balanced) versions. This is a very good thing. The Borders of Kanta will be launching on Kickstarter this week. Check back later and we’ll update the preview with the direct link. Until then, you can find out more information on the Chinook Games website.